Agni and his sister, Luna, live on a frozen Earth cursed by “the Ice Witch.” The siblings are also among those known as “The Blessed,” people born with abilities to perform miracles. Some of “The Blessed” are unfriendly, like the man called “Doma.” He is blessed with the power of fire, which he uses to destroy Agni and Luna's village and to kill Luna. Doma engulfs Agni, who has regenerative powers, in a flame that will never extinguish. Now, Agni is a walking man of flame, seeking revenge. As Fire Punch, Vol. 5 (Chapters 40 to 49) opens, Agni and Togata, the mysterious girl who is his partner, exchange harsh words. The painful truth about Togata's gender has been revealed, but Agni does not want their relationship to change... that much. Now, Agni has decided to face his destiny – seeking and killing the man who has caused him so much pain, Doma. But even he has changed. THE LOWDOWN: It is true that the Fire Punch manga is full of surprises and continues to offer surprises. This tough-minded, dystopian thriller goes in unexpected directions, which is true of the current volume. Fire Punch Graphic Novel Volume 5, like the previous volume, is full of crazy-acting people. Creator Tasuki Fujimoto depicts the mercurial nature of Agni in fire and fury, and at a pivotal point, one wonders about the nature of Agni. The ending of Volume demands a return engagement, and Fire Punch is proving to be too full of surprises to ignore. 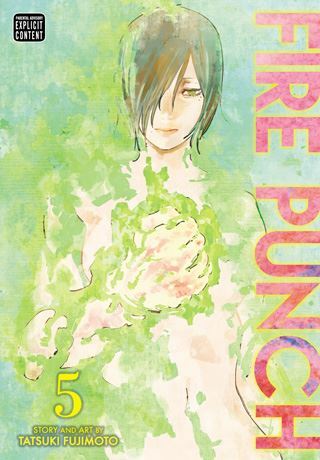 I READS YOU RECOMMENDS: Readers looking for dystopian science fiction manga will want to try VIZ Signature's Fire Punch.